What better way to get over a cooking disaster than to attempt to make that notoriously easy dish: bread. BREAD. Like, with yeast and proving and everything. Also, in case it helps you to know, I'm not crazy over breadsticks (I've never seen the point of them), and nor am I keen on cheesy bread (too greasy for my liking). So, certain that I was onto a winner, I got going. Surprisingly, I was able to get the dough to rise, although I may have fallen down on the kneading (I always fall down on the kneading). The dough was very difficult to roll out flat like the recipe says, because it kept springing back (especially because it was on an oiled surface). Did I knead it too much? Certainly the finished item was a little on the hard side (transforming into rock solid the next day), but maybe grissini are supposed to do that? (I have no idea.) The taste was greasy, as expected from the parmesan, and maybe I added too much oil when kneading as well. But, do you know what? I ate these with soup, which was a perfect antidote to both the hardness and the greasiness, so they were actually very pleasant! I was so worried about making these. 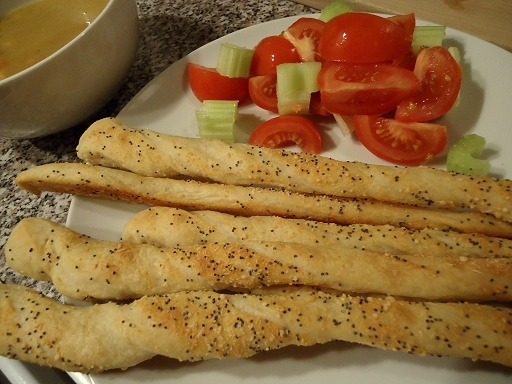 Not only did I make them shortly after the breadsticks (no rest for the wicked), but I attempted to use the Italian meringue method. Now, I've seen some people claim that the Italian meringue method for making macarons is far easier than the French meringue method, and that Italian meringue macarons turn out perfect every time. Allow me to scoff. Pah! The first and only time I'd tried the Italian meringue method, all my macrons ended up in the bin (after trying to dry them with a hairdryer, then underbaking them, I figured they would be unsafe to eat). And now I was (foolishly?) just about to attempt the Italian meringue method again. On making them, I was surprised to find that they turned out kinda ok. Not great (many of them cracked), but definitely edible and not destined for the bin! So, whether I did something wrong on my first Italian meringue attempt, I don't know. 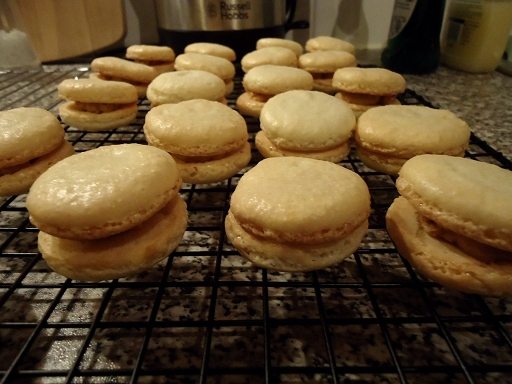 The fact that these still cracked after copious drying time suggests that the moisture from the syrup in the Italian meringue does not make these macarons suitable for a damp British climate (of course, I could be entirely wrong on this). Oh, and I put a tray on the oven shelf above the macarons, to try to stop them from browning, but that didn't work (the joys of a non-professional oven, I suppose). The peanut cream inside these macarons is unadulterated peanut butter. As an aside, have you ever tried piping crunchy peanut butter with a piping bag? DON'T. Just use a knife to spread it like a sensible person, otherwise you're going to have to stop every 60 seconds to perform piping bag surgery with a chopstick in order to remove a particularly large bit of peanut. I wasn't sure what these were going to taste like, but it turns out they're really nice. The sweetness of the macarons pairs really well with the saltiness of the peanut butter. (If you've ever had a Reese's peanut butter cup, you'll find the taste quite similar.) It feels like such a relief to finally make these Italian meringue macarons without a huge disaster. Now I've laid that ghost to rest, I can finally move on. I made these the day after the macarons in order to use up the leftover egg yolks. I found the dough for the biscuits to be very crumbly. Even after refrigerating the dough, it still kept wanting to fall apart, hence all the fault lines you can see in the photo. Still, no-one cares if biscuits don't look perfect. They were light and rich and very nice to eat (even those that got slightly too dark on the bottom). Can we just take a moment to admire the fact that I didn't burn this chicken leg to hell and back? (I don't think there's any reason for it not burning, just that there's less sugar in the sauce. I certainly cooked the chicken for longer than I was told to.) 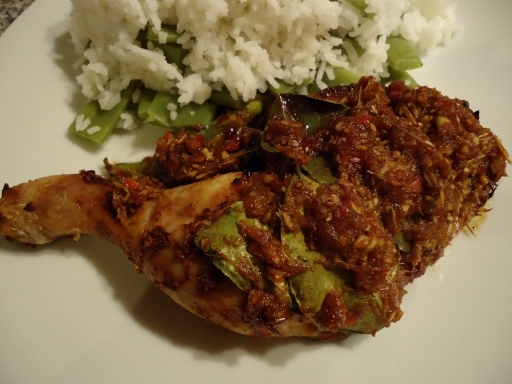 This recipe is meant to be called "baked curry leaves chicken legs", but I couldn't find curry leaves at all, and I read somewhere that you could substitute kaffir lime leaves. That, however, wasn't what I was worried about in this recipe. You see, the recipe recommends five birds eye chillies for two chicken legs. As a person who can't take much heat, I was scared that five of those little devils were going to make this dish inedible for me. I got a further scare when I added the two tablespoons of Thai fish sauce that the recipe calls for. I don't use fish sauce often, so I'm not used to the smell, and I've never used this quantity of it before. The smell when the chicken started heating up in the oven was unholy. Still, as all things fish sauce, the smell got better as it cooked, and the taste was not unholy at all; just savoury. Overall, the dish tasted very citrus-y, which is probably from the lime leaves and the lemongrass. Thankfully, the chillies weren't quite so astronomically hot as I thought they might be (but I still couldn't eat too much of the sauce with the chicken). This dish was a thing of beauty! 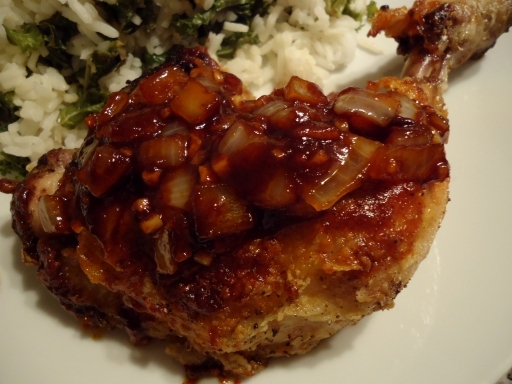 Just look at that glossy sauce with the chicken all crispy underneath. My God, it was good to eat. But wait. I'm getting ahead of myself; let me describe the cooking first. Finding the ingredients for the dish wasn't easy. 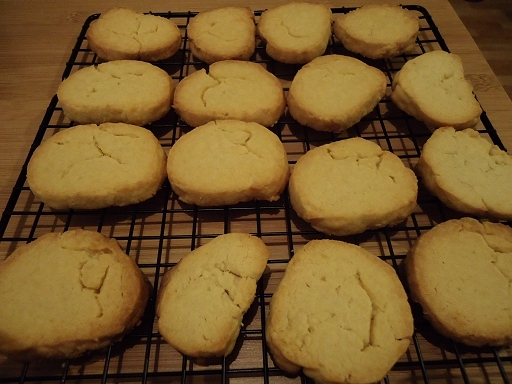 The crisp coating is meant to include tapioca flour, glutinous rice flour and plain flour; I couldn't find the first two of those, so I substituted with a mix of plain flour and cornflour. Also, I didn't add the Shaoxing wine to the marinade, but the dish didn't seem to lack in flavour. As on previous occasions, the recipe calls for the chicken to be deep-fried, and as on previous occasions, I am far too cowardly to deep-fry anything, so I pan-fried it, followed by a spell in the oven. Thankfully, the skin came out really crispy (the baking powder in the batter may have helped with that). And the taste was to die for. I was worried that the Korean chilli paste would be too hot for my tastes (having never eaten it before). It was hot, yes, but not too hot, and it has a really great smoky flavour (I am a convert). Along with the smoky flavour, you get the punch of the ginger, onion and garlic, as well as this sweetness from the sauce. Combine it with the wonderful crunch from the fried chicken, and you get something very close to perfect. If this recipe wasn't so involved, I'd make it all the time. As I'm lazy, however, there must be some place in London that will sell me some; I need to start looking! I’M STILL TRYING TO DEAL EMOTIONALLY WITH THE FACT THAT YOU DON’T WANT PEOPLE TO PUT CHEESE ON TOMATO PASTA. I also feel like maybe you should give up on the chicken legs, because they are clearly causing you distress. No chicken is worth that. 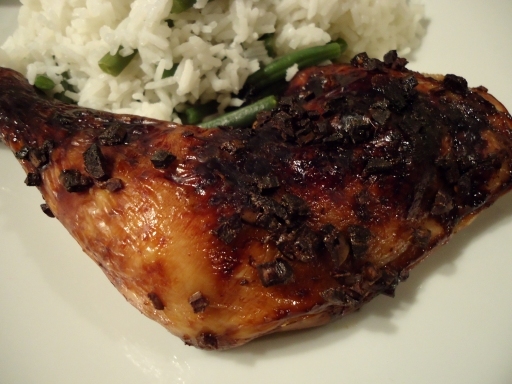 I should stipulate, however, that I love burnt-up meat and often scrape the tar-like deposits of scorched sauce off of baking sheets when I make chicken myself, so I can gnaw on it. Haha, beat that! I have never heard of grissini, but dough that springs back probably hasn’t been allowed to rest long enough. Gluten contracts during kneading, and dough needs to rest after being handled before it can be shaped. Although I’ve never heard of kneading dough with oil, either, so what do I know. CLEARLY YOUR PROBLEM WITH THE MACARONS IS THAT YOU LACK A DEDICATED MERINGUE OVEN. They look pretty good, though! There is nothing you can do to a cookie to make me dislike it. The last two chicken legs look like photos out of a cookbook; perhaps you shouldn’t break up with them after all! I just wanted that in here somewhere. Do you know what, there is something quite satisfying in chewing a piece of meat that’s gone a little crispy and hard through overcooking, so I think I can see where you’re coming from. Gluten doesn’t “like” anything, to be honest. It is malevolent and bears a fractal-scale chemical resemblance to a rubber band (really), and has to be either coaxed to behave or violently put in its place. On that score, at least, gluten-free baking is much easier; mostly you just stir it up and shove it in an oven. The returns are less impressive, however. The change between your first food posts and the newer ones is impressive. You’re getting really skilled, and it shows.